You Got Your Dental Implant . . . Now What?!? Dental implants are one of the most exciting advances in dental treatment. They allow you to replace one or more missing teeth in the most natural way possible. They replace both the roots and the crown (exposed portion) of teeth, so they function as well as a natural tooth. We often claim that one of the biggest advantages of restoring a tooth with a dental implant is the fact that it cannot get a cavity. This is exciting news for patients who have a high risk for developing cavities. When other dental treatments like root canals and fillings fail due to recurring cavities, a dental implant will not! The problem with this exciting news is that it could mislead people to believe that once you have your dental implant, you are home free. This false belief could cause you to neglect important oral hygiene and maintenance of your dental implant. Make no mistake: Dental implants can fail! They just don’t fail because of cavities. We can break down the causes of implant failure into three main categories. At Designer Smiles, we work closely with you and your physician, if necessary, to overcome any potential healing challenges when placing dental implants. There are certain health conditions, like diabetes, that affect the body’s ability to heal around and incorporate an implant. Habits like smoking also have a negative impact on the healing process. We believe that it is our responsibility to inform you of any potential healing problems you may encounter and help you to overcome them by making the appropriate changes in diet, medication or habit to improve your success rate. Dental implants can suffer from gum disease in the same way a tooth does. The implant’s success directly relates to the health of the jawbone and gum tissue that attaches to it. Toxins from the bacteria in plaque and tartar buildup destroy the attachment between the implant and the bone. Bone loss (periodontal disease) causes an implant to fail in the same way it causes a tooth to loosen and fall out. There is a difference between the way an implant receives bite forces compared to how a tooth does. Teeth have a “shock absorber” between the roots and the jawbone called the periodontal ligament. This ligament provides a little leeway when it comes to bite forces. A dental implant does not have a periodontal ligament, so it lacks the shock absorption effect. This means that the bite forces on a dental implant crown must be absolutely perfect. Improper angles or heavy forces can break the attachment with the jawbone and lead to bone loss. 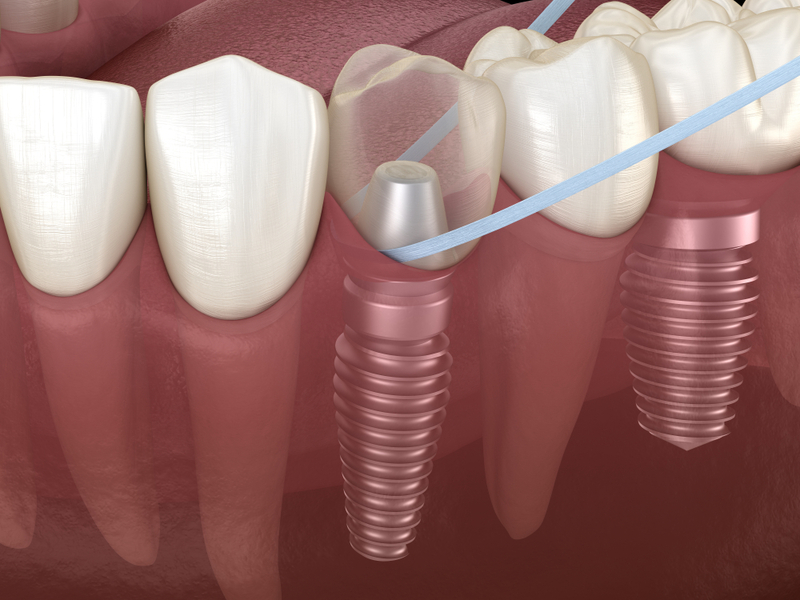 What Implant Maintenance is Necessary to Lower the Risk of Failure? The bad news is that implants can fail. The good news is that with proper maintenance, you can greatly reduce the risk of that happening! In general, implant maintenance addresses the second two factors listed above that commonly cause an implant to fail: gum disease and improper bite forces. With proper cleaning, both professional and at home, you can reduce the risk for gum disease. With consistent dental evaluations of the implant, you can ensure that your implant is receiving the appropriate bite forces. An implant is as close as we can get to a natural tooth, but some important differences remain. Most implant crowns extend below the gum tissue and become much narrower than a natural tooth. This makes correct flossing a little more technique-sensitive and the area available for plaque buildup a little larger. 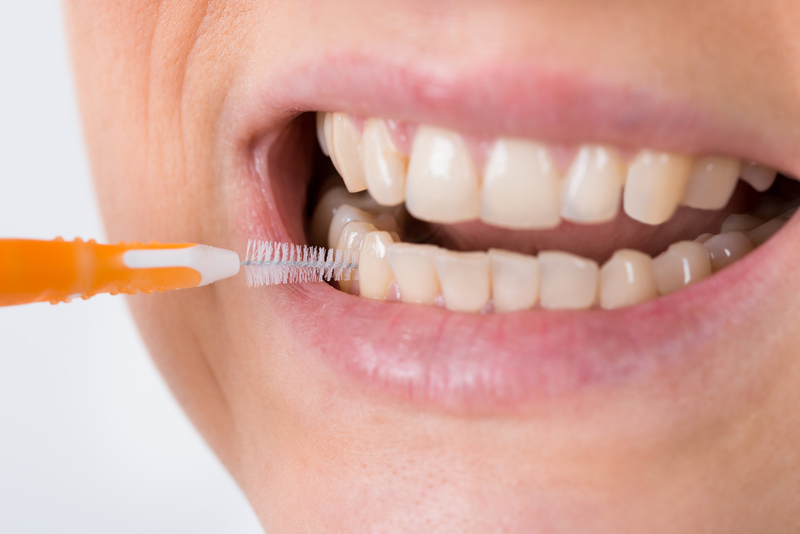 To properly clean around a dental implant, it is essential to use the flossing technique Phyllis and Nancy, our wonderful dental hygienists, recommend. You may also need to add some additional teeth cleaning tools to your oral hygiene regimen, like Proxabrushes or GUM Soft Picks. These can remove plaque and food debris from larger openings at the base of an implant crown. Ask Phyllis and Nancy for the best tools for your specific situation. Professional teeth cleanings with your dental hygienist on a consistent basis are important to the long-term health of your dental implant. The hygienists is able to reach deep underneath the gums to both evaluate and clean any areas of pocketing that could lead to dangerous implant gum disease. At Designer Smiles, we see each dental implant patient for a professional teeth cleaning every four months. This consistent schedule helps us catch any red flags of gum disease and prevent it from progressing to full-blown implant failure. The mistake many people make with dental implants, especially if they do not have any remaining natural teeth, is to assume that they do not need to see the dentist again unless there is a problem. By seeing Dr. Ann and Dr. Lauren for consistent evaluations of your dental implants, they can improve your long-term success rate. As we described above, one of the factors that can increase the risk for implant failure is improper bite forces. 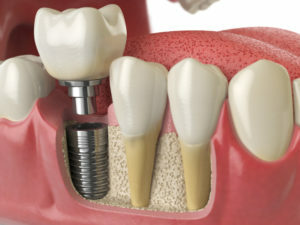 Because teeth are constantly shifting and moving (in microscopic amounts), the bite forces on an implant crown can change. The implant does not move, but everything around it does. An important part of implant maintenance is checking the bite forces it receives at each dental checkup. Dr. Ann and Dr. Lauren will make any necessary adjustments to ensure your implant only receives the correct amount and direction of force. If you exhibit any signs of clenching or grinding your teeth at night, Dr. Ann and Dr. Lauren will stress the need for you to wear a nightguard while you sleep. Clenching and grinding, known as bruxism, puts inappropriate forces on a dental implant. 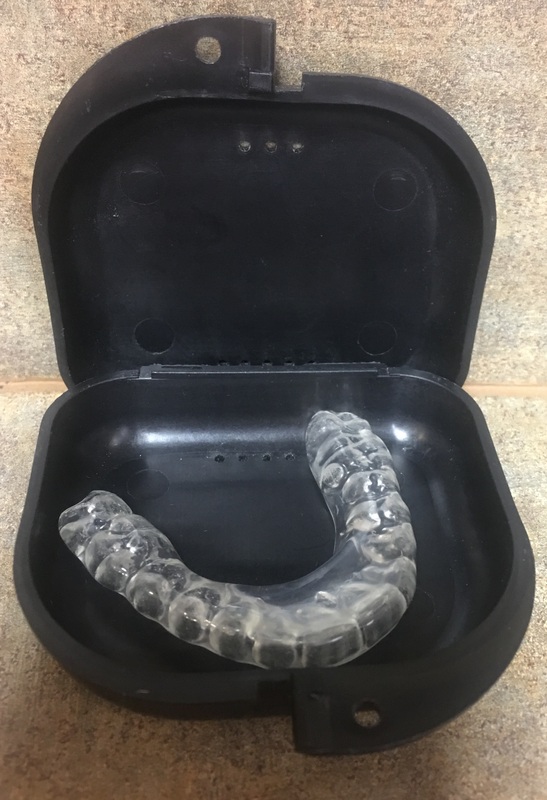 Wearing the nightguard lessens and redistributes those forces, protecting your implant investment. Do You Need Help Maintaining one or more Dental Implants? Call Designer Smiles today to schedule a consultation with Dr. Ann and Dr. Lauren. They will help you understand your unique areas of risk and how you can work to lessen those risks. When properly maintained, dental implants can outlast you! Ask us how we can help you protect your dental implant investment.